This entry was posted on March 2, 2015 at 10:42 pm and is filed under Astronomy, Biology, Catastrophe, Earth, Evolution. You can follow any responses to this entry through the RSS 2.0 feed. You can leave a response, or trackback from your own site. You left rogue planets out of your disaster parade… Although I guess that’s what mentioning SEDNA was all about. If Sedna were a gas giant. And orbited closer… BOOOM! 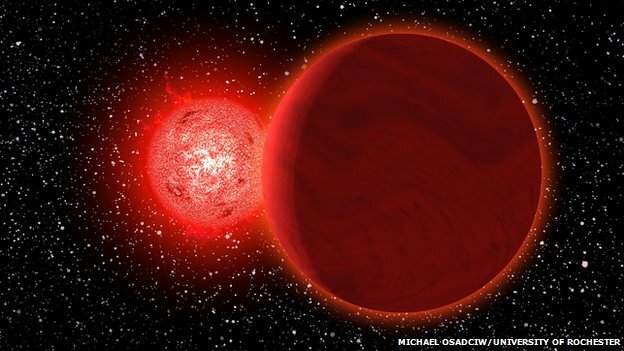 Rogue planets, except from very great unluck, are more a symptom than a worry. They show the instability of this whole celestial mechanics. If the disk lasts longer, the planets keep accreting as the gas/dust continues heading towards the star, albeit at a rate about 4 orders of magnitude less than in the first My, so the planets simply keep growing. If they get big enough, and they are close enough together, they start playing gravitational billiards, throwing one out, say, and sending the other on an eccentric orbit inwards. That explains why so many orbits are highly eccentric. If the orbit is sufficiently eccentric or the semimajor axis is small enough, tidal interactions with the star circularise the orbit. That, by the way, is what I believe, but I did not originate it. For anyone interested, this and a number of what some would call heresies are in my ebook, Planetary Formation and Biogenesis. Dear Ian: Your theory is interesting. What it boils down to, it seems to me, is that you envision very dense star systems, with large planets close by. I agree that then, thanks to collisions some will end up close to the star. So the question is: how many systems are born as ultra dense clouds? If a large percentage of them are not, then the mechanism I propose may not be so unlikely. All the more since many stars are born in star-dense zones (lots of star near-misses afterwards… Especially on the timescales you suggest… A few million years). In any case, it would have an impact on life: a planetary system with haphazard planets will be hostile to life. I am just suggesting that, in star system long established, star near-misses would be a much more serious problem than rogue asteroids, comets and the like. The system doesn’t have to be extremely dense,although it depends on what you mean by “dense”. The concept is there dis a continuous flow of gas and dust towards the star, and the planets collect what goes by in their gravitational zone. Rather than dense, the gas has to continue flowing for a long time. Also, if you mean by dense, compact, then yes, compact helps because planets perforce being closer together have greater gravitational interactions. Basically, in my theory systems become a lot more compact if the star is smaller, and observations of red dwarfs are in accord with this. Just love it when you write about science I can more or less follow. BTW, the non-understanding of Quantum Physics is a scientific problem, not just a pedagogical one! Agree with Dominique especially the “more or less” part of his sentence! Although I can’t resist lowering the tone of things by passing on that well-known statistic that 6 out of 3 scientists are dyslexic. Dear Paul: This was written fast, so it’s far from perfect, I actually forgot to indicate the Red Dwarf’s speed, 80 kilometers per second (an important point, because the faster, the less of a gravitational influence). So you can just cut and paste what seems obscure, or a typo, and put it in a comment, ;-)!